WASHINGTON -- First lady Michelle Obama chose a dress by a Chinese-American designer for Friday's White House dinner for Chinese President Xi Jinping. 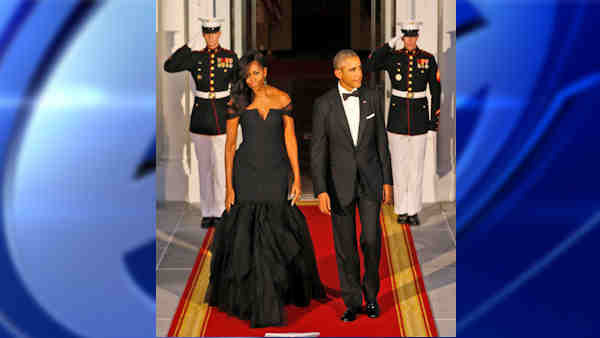 Obama wore a custom-made black, off-the-shoulder mermaid gown by Vera Wang Collection for the occasion. Fitted, with sheer sleeves, it skimmed the floor with its silk organza flounce. Mrs. Obama swept her long hair off to one side. The first lady has worn Wang's designs before, winning raves for the draped, strapless, electric blue column she donned at The Kennedy Center Honors in 2011. China's first lady Peng Liyuan, also a fashion icon, selected an embellished silk gown in a rich aquamarine hue. With three-quarter-length sleeves, it boasted intricate beading on its bodice and skirt. Peng was considered more famous than her husband when he took office in 2013, having enjoyed a long career as a singer of ballads and patriotic anthems with the People's Liberation Army arts troupe. Since then she's emerged as a key force for Chinese "soft power," ever present by her husband's side during trips abroad, unlike previous first ladies who largely stayed in the background. Those appearances have made her a fashion icon. The outfits and accessories she wears often sell out soon after the designers are identified. She wears Chinese designers exclusively, both to show her support for homegrown talent and to avoid the accusations of being a show-off or spendthrift frequently leveled at public figures who appear in Western luxury wear. The name of the designer of Peng's gown for the China State Dinner was not immediately available.